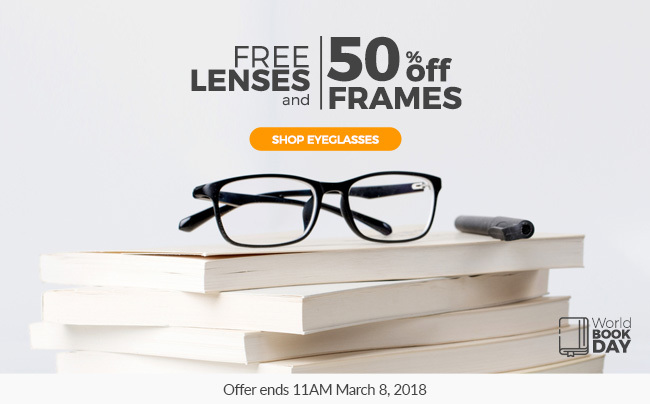 NEW YORK - April 16, 2018 - PRLog -- SmartBuyGlasses, one of the world's leading online providers of designer eyewear, will be celebrating World Book Day by providing its customers with a huge 50% off its Arise, SmartBuyCollection and Clear Readers collection frames, with free lenses included. No code is required, the offer is open to all customers who make a purchase on 23rd April 2018. World Book Day (https://www.smartbuyglasses.com/c/book-day) is a global event that celebrates authors that celebrates authors, illustrators, books, and the importance of reading and education. As the world's leading provider of designer eyewear, and with over 80,000 styles for customers to choose from, reading is at the heart of all that SmartBuyGlasses stands for. Most importantly, World Book Day is an opportunity to encourage the younger generation to read and expand their minds through education. This is why SmartBuyGlasses is also offering 50% off all their Kool Kids collection frames. They aim to promote free and accessible education for all, and to help enrich the lives of young people by improving their learning experience. Providing their customers with great value is key for SmartBuyGlasses. When customers opt for paid lenses, they also provide an incredible triple lens coating (anti-scratch, anti-reflective, UV protection) as standard. In addition, they provide all the benefits of a physical store, allowing every customer to preview their chosen style via innovative virtual try on technology. David Menning, MD of SmartBuyGlasses said: "SmartBuyGlasses ensures that the service we provide is echoed in our customers experiences with us, so it's perhaps not surprising that when it comes to a global event, such as World Book Day, we want to throw our support behind it. smartbuyglasses.com (https://www.smartbuyglasses.com/) is part of the Motion Global group and is one of the world's largest designer eyewear e-commerce companies, with operations across Asia Pacific, Europe and the Americas. Currently operating in over 30 countries & 15 languages worldwide, the website offers over 80,000 products from a range of 180 different brands. Their mission is to provide high quality designer eyewear at affordable prices.